Paris, city of love. I’ve only met you once before, during a party weekend about 7 years ago. We didn’t really connect. Here’s why. The road trip to Paris was long and rainy. With too much traffic. Hours and hours of traffic jams. It rained. All. The. Time. I slept over at a friend’s place… with 5 chicks and 1 guy in a tiny room in a student’s house. No walls but curtains. Yes, this happened. Last time, I was drunk/hungover the whole weekend. With rain. All the time. And no privacy. That’s all. All the French people I met where mean to me. I don’t know why – because I was drunk/hungover/grumpy (all at the same time)? Anyway, the people didn’t seem to make me want to feel better. Booh. The trip to Paris was much more comfortable (understatement). Thalys is in my opinion the best and most comfortable way to travel from Amsterdam to Paris. We were travelling first class where you get a 3 course meal (which included a quinoa salad, omg yes), free wine and wifi – very very slow, but still good enough to check and post on Instagram. 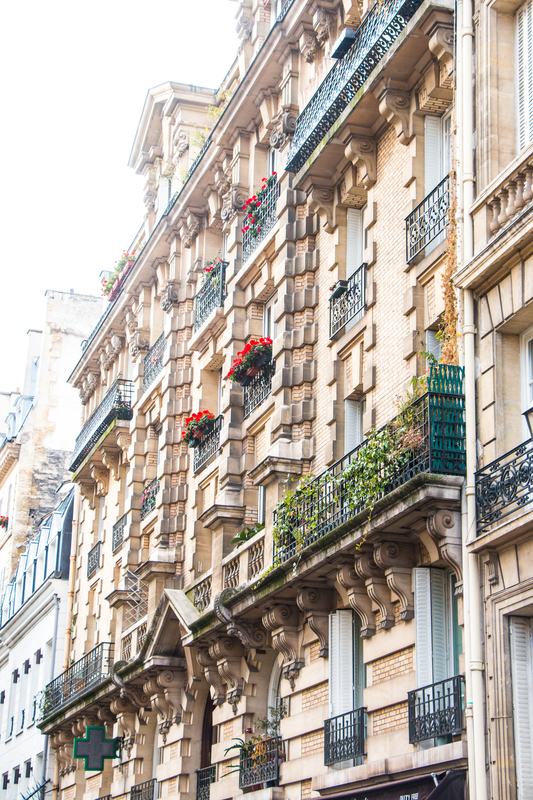 Last but not least – I found Paris’ best kept secret. The Hidden Hotel. 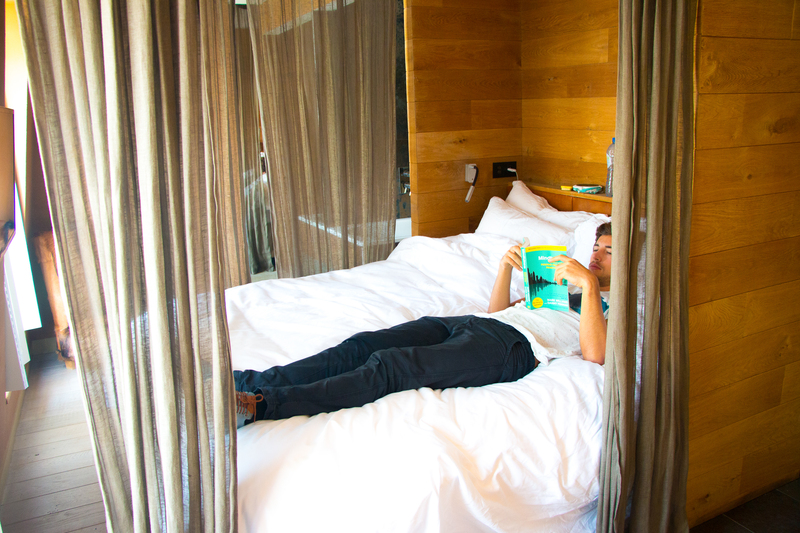 The friendly staff checked us in and brought us to our room, the Sensation Room – which was indeed sensational. 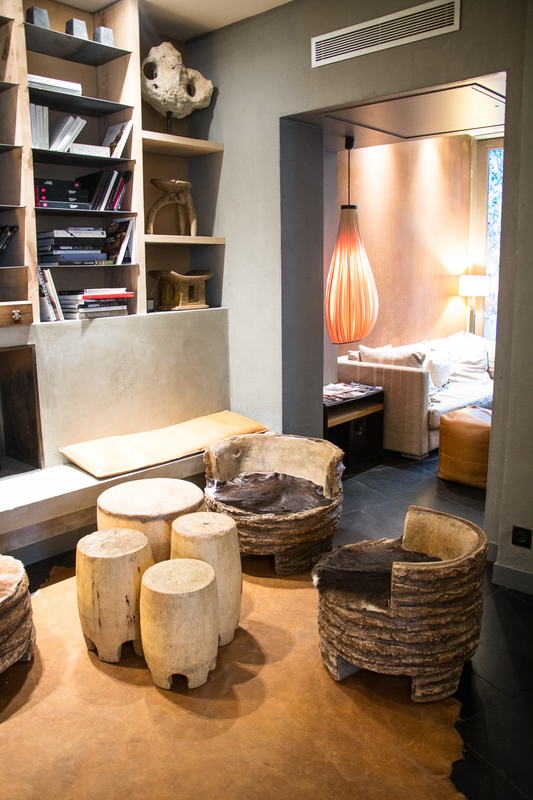 Romantic with an organic touch (wooden and stone details) and very well designed. The dreamy coconut bed is set up in the middle of the room dividing the bathroom and bedroom, making clever use of the space. 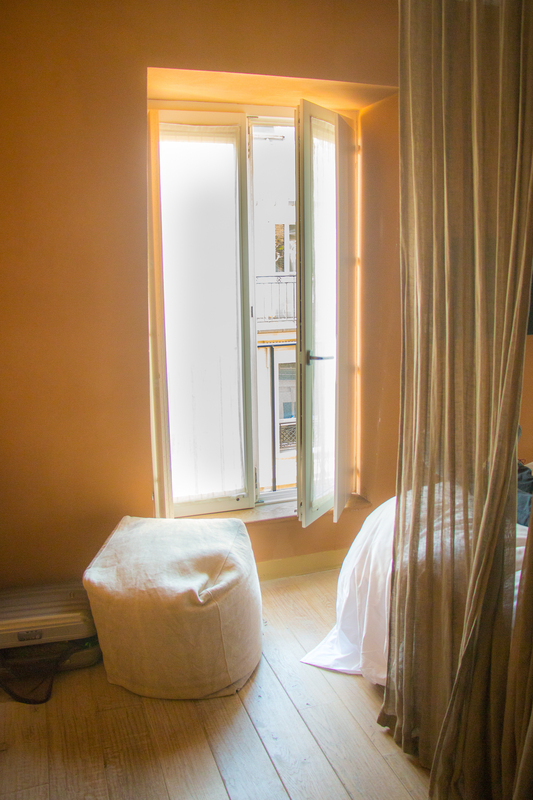 The coconut bed was really comfortable and the surrounding curtains provided an extra dreamy atmosphere. 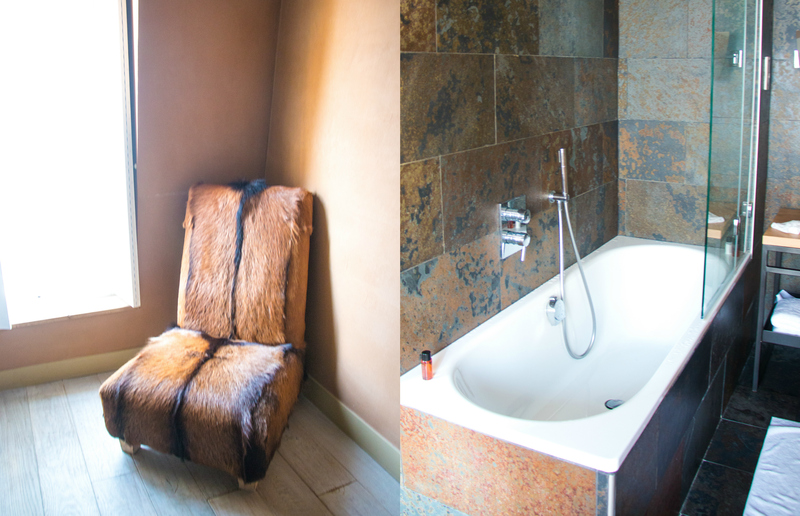 The bathroom was very simplistic but beautiful, with organic stone & wooden details in pretty natural colours. 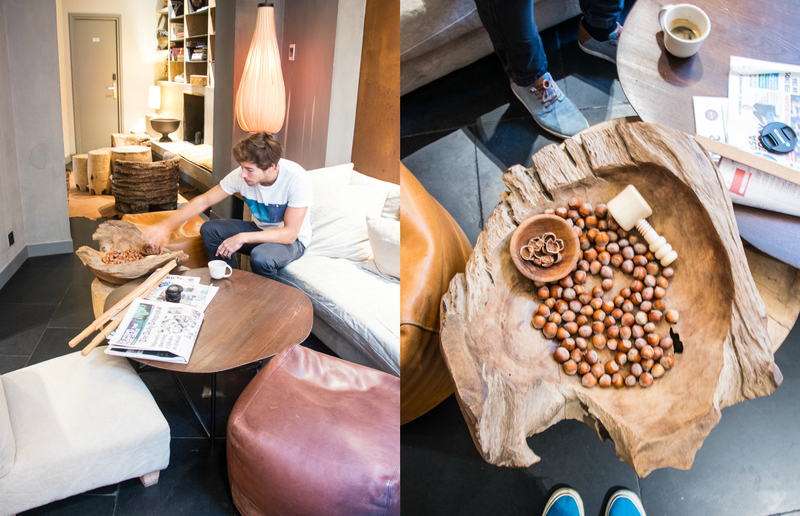 After breakfast, we hung around for a coffee – checking out the rest of the lobby and lounge area – which is just as charming as the rest of the hotel. 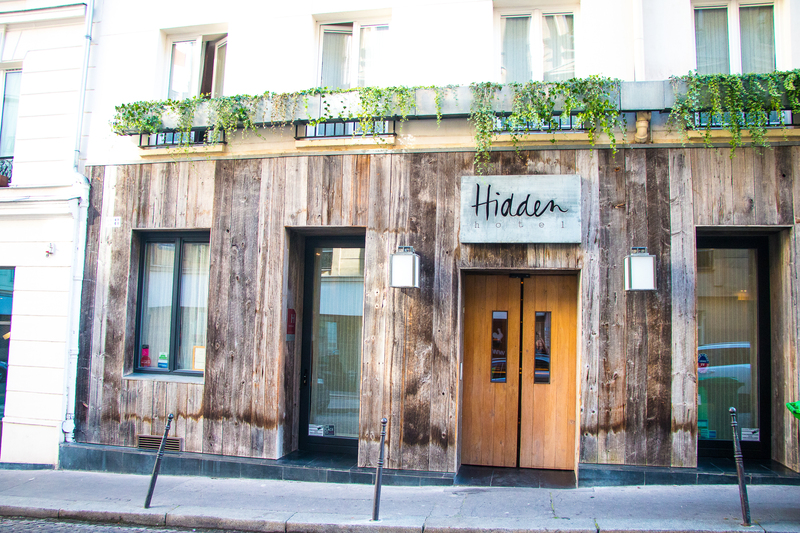 All together, I had a great time at the Hidden Hotel in Paris. 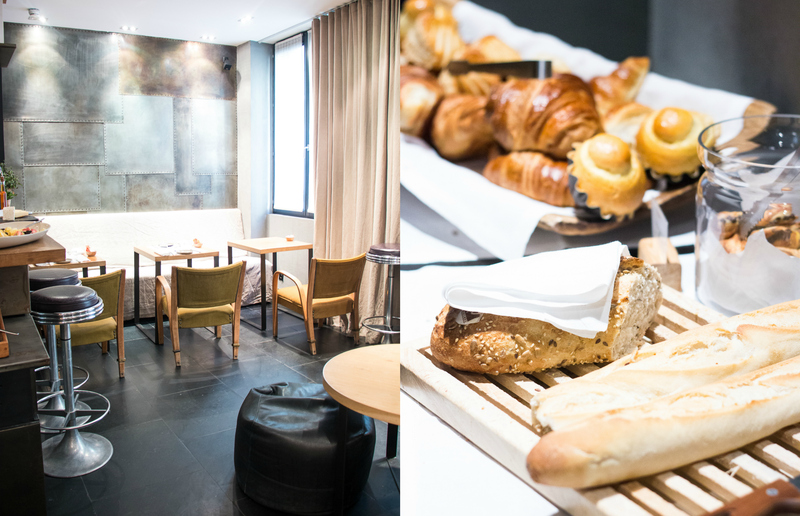 The staff is really friendly and funny, the interior design is beautiful: cozy & modern at the same time and the breakfast is outstanding! 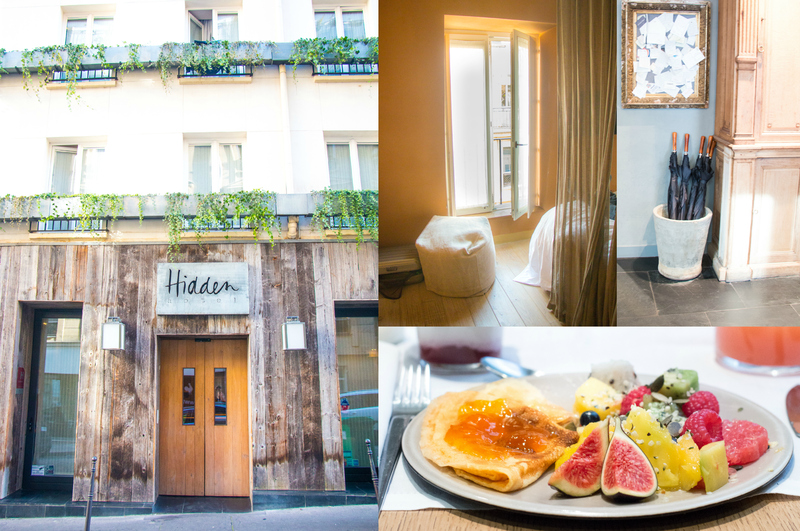 I spend the night at the Hidden Hotel thanks to the service Snaptraveller – perfect for bloggers. It’s a service where you can ‘pay’ with your influence – with a blog or review like this one. Dix Huit – Great food, excellent staff. The first night, we had dinner at a very nice restaurant just a short distance away from the hotel: Dix Huit. 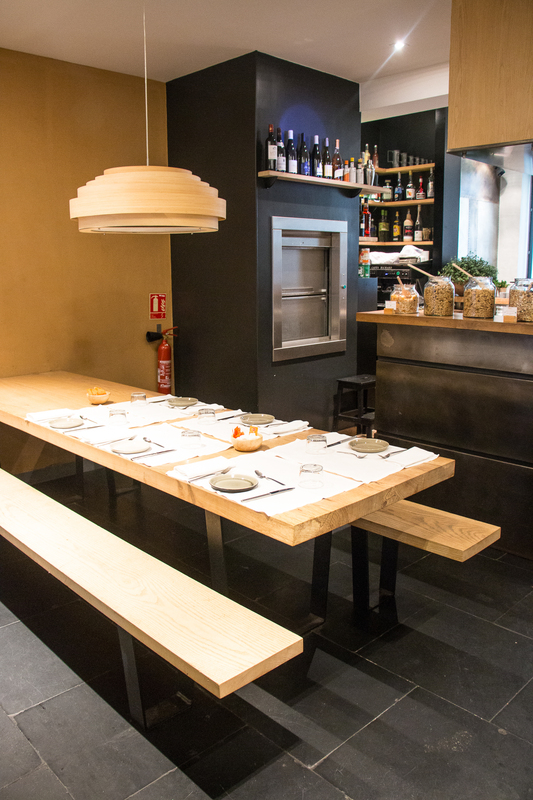 If you’re travelling to Paris any time soon, please go check out this restaurant! 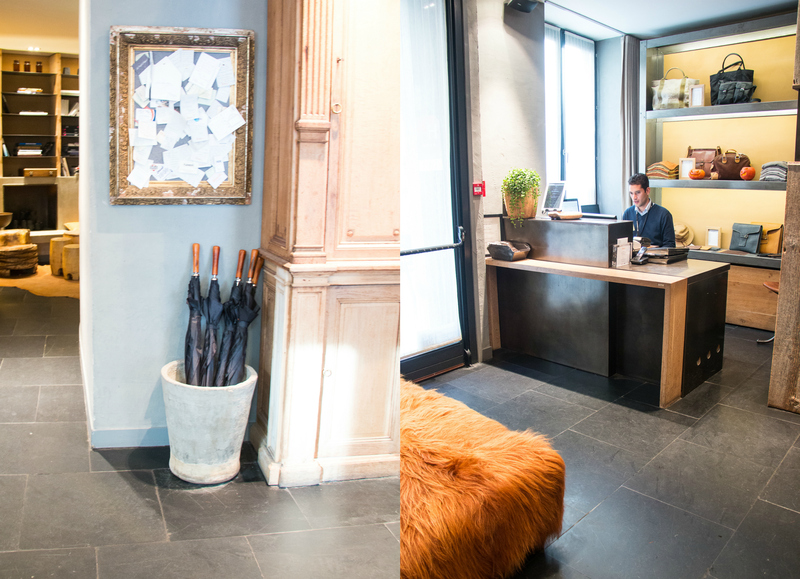 The menu is in French – but the waiters will try to explain the best they can (very very friendly and charming staff). The dishes they offer vary from week to week and even day to day – making use of seasonal veggies and so on. We ordered ceviche which was really good, a perfectly cooked white fish with crispy veggies and tasty sauce, the dessert was a small apple pancake with granny smith sorbet ice cream… So good! The light at the restaurant was not that good for food photography – food photographers should always go out for dinner during lunchtime 😉 – but I did my best to take some photos with my iPhone. Cosi – Healthy tasty sandwiches and big healthy salads. We had lunch at a cute sandwich shop with really tasty sandwiches and big salads (check out mine here) – it’s called Cosi. Not expensive and healthy! Septime – A well balanced, pure and refined seasonal menu. Clamato – Great spot to eat/drink wine without having to reserve a table. Chateau Briand – Always good, from 9pm waiting in line for a spot. Vivant – Wonderful food, charming setting. Frenchie – Next level food. Make a reservation a month in advance! l’Arpege – Great staff, food & wine. Bones – Inventive, creative food. 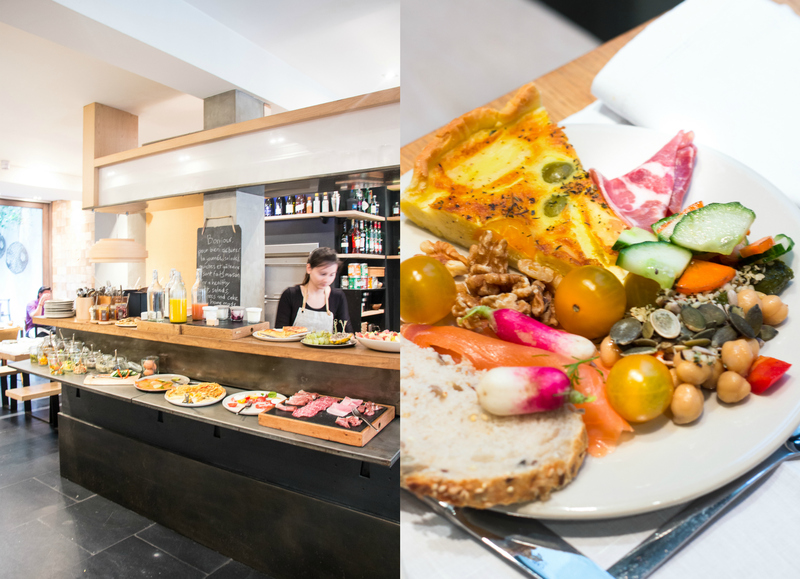 The Broken Arm – Great place to have lunch. Nanashi – Japanese fusion kitchen. Holybelly – Hip coffee/lunch spot. 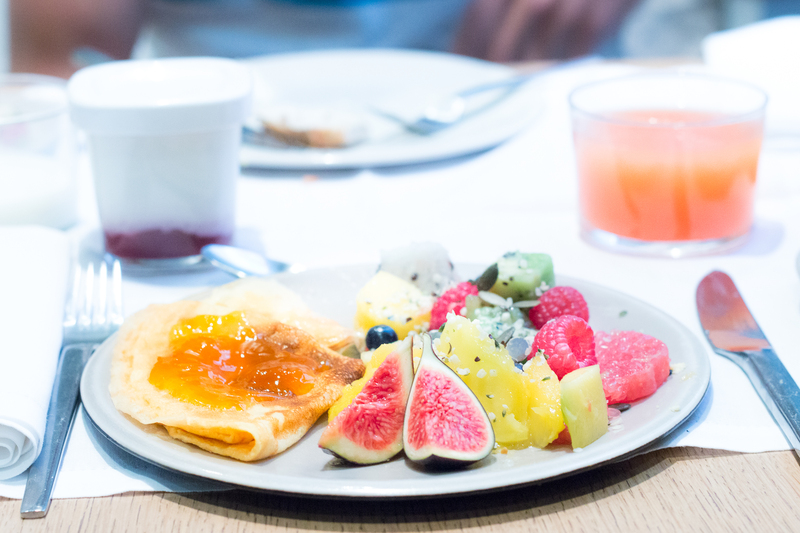 Cafe Smorgas – Small restaurant with a healthy kitchen. 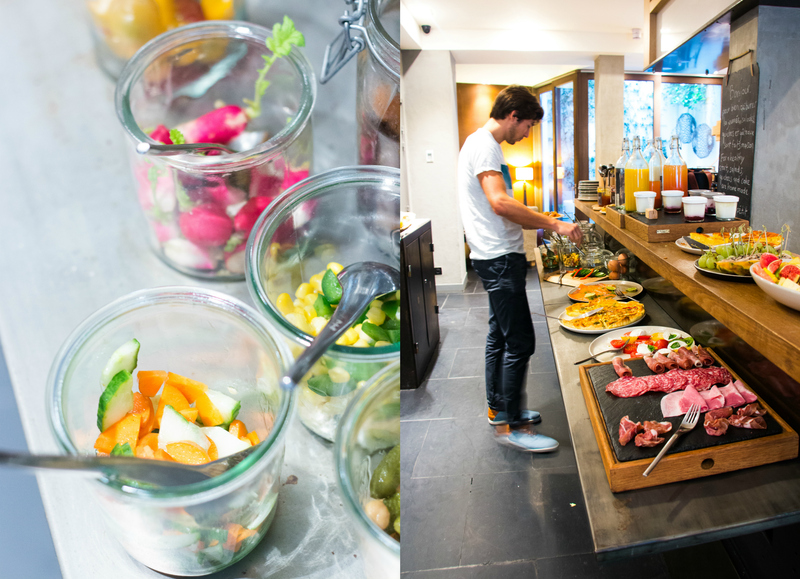 Beaucoup – Sunday’s brunch with a 3 course meal or buffet. Pinson – Healthy stuff! You would love it. Be sure to visit her Facebook page, Instagram page and blog. When in Paris… Pet cats! Yes. A cat cafe. In Paris. 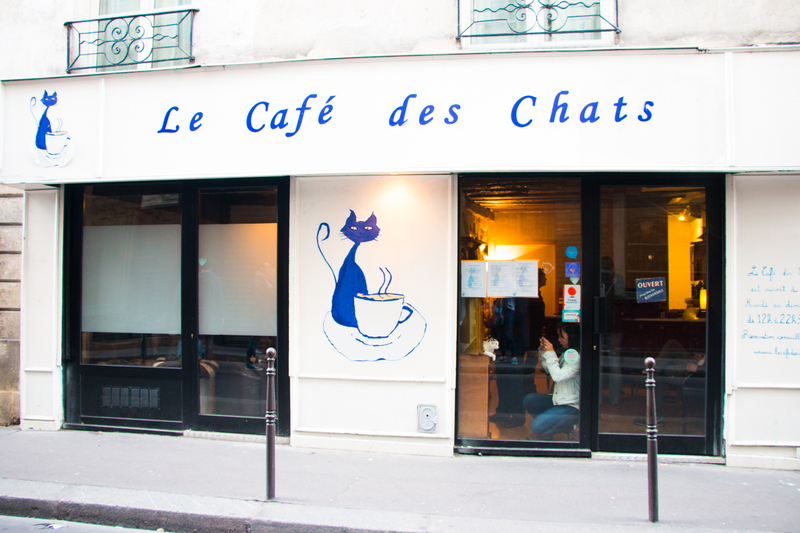 Le Cafe Des Chats. Apparently, you have to reserve weeks in advance. But if you’re a cat lover and visiting Paris, please do because I think it will brighten your day ;). 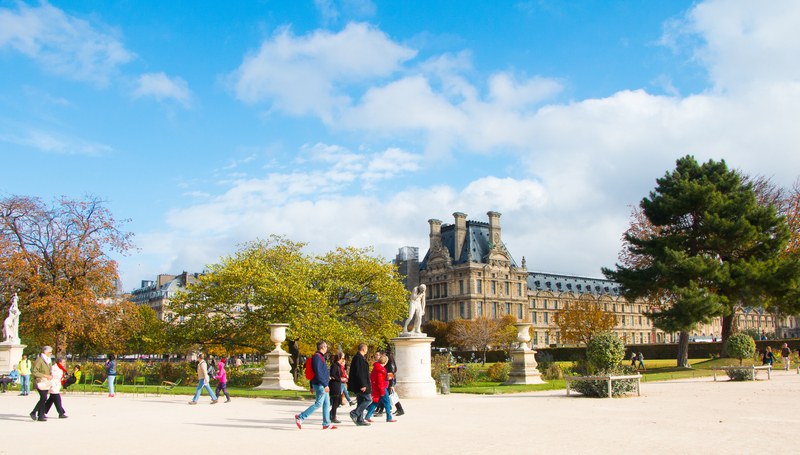 Do you have tips for people travelling to Paris? Please leave them behind in the comments!